Remember all the endless recent speculation as to whether Honda would someday build a real RWD pickup? Well, they already did, in 1963. In that inimitable Honda way, it stood the world on its collective ear: DOHC, four carbs, 30 hp from 360cc at 8,600 rpm and a top speed of 60 mph. 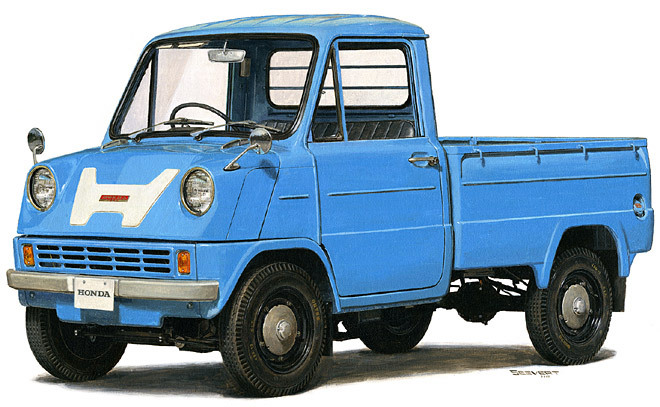 As an antidote to the mild-mannered Hondas sent our way in the ’70s and early ’80s, like the first-generation Prelude, the T360/T500 trucks were anything but boring–and the story of how these eminently practical little trucks ended up with the engine from Honda’s crazy little S360 sports car is a wild tale only Honda could spin. 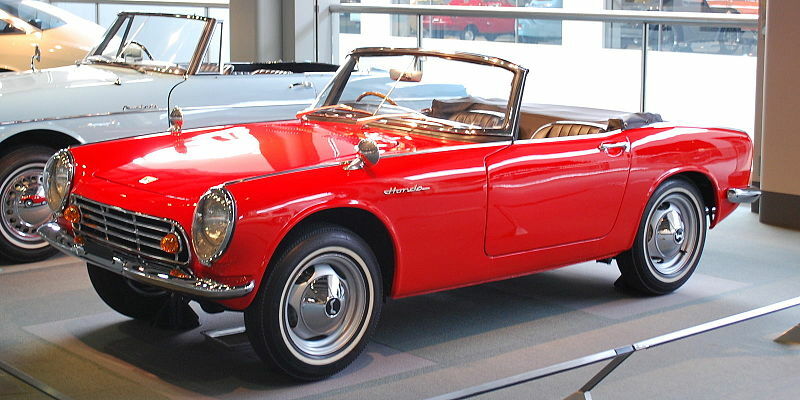 In the early ’60s, Soichiro Honda was ambivalent about entering the automobile business. However, in 1961 Japan’s all-powerful MITI (Ministry of International Trade and Industry) forced his hand by advancing a bill aimed at limiting the number of domestic car manufacturers. Honda lobbied against it, and lost. The solution? Get into car production, and fast. Soichiro’s vehicle of choice was the S360, which became the production S500. It was a buzz-bomb of a roadster, with an engine that only Honda, with its motorcycle racing experience, could have built then: A four-cylinder, four-stroke, four-carb DOHC design with a 9,500 rpm redline that belted out 44 hp. At a time when the finest European production sports cars, like the Porsche Super 90, proudly generated 50-55 hp/liter, the Honda’s near-100hp/liter was simply revolutionary. Nevertheless, a serious question remained as to the actual volume in which such a sports car could find buyers. 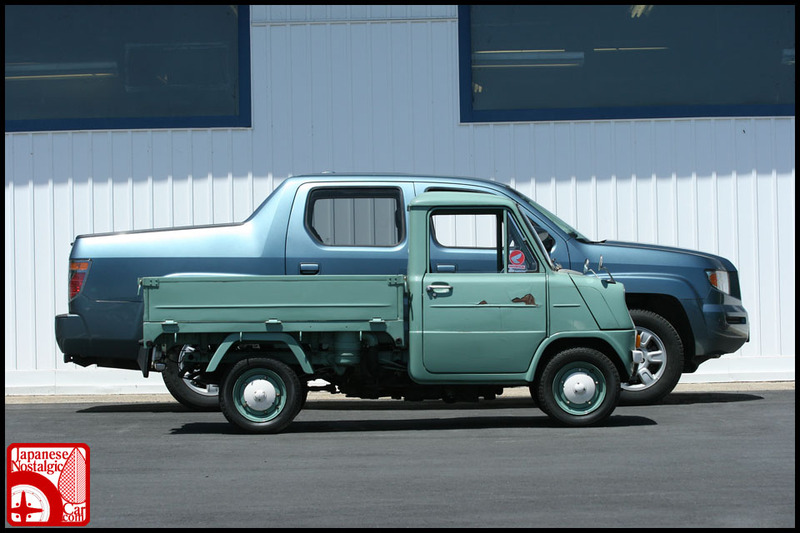 Happily, the ebullient, right-brained Honda was fortunate to have a very pragmatic sidekick, Takeo Fujisawa, who convinced him that there was indeed a real market for light trucks. And thus, in a most unlikely marriage, did one of the world’s highest-specific-output sports-car motors end up in this milestone T360/T500 truck–a feat whose modern equivalent might be putting the S2000 roadster’s engine into a workhorse truck like the Isuzu NPR. And thanks to Honda’s remarkable ability to make engines that held together, it was a perfectly successful and reliable little beast, especially the difficult driving conditions at that time: Japan’s first freeway was still being built, and most country roads were in very poor shape. Honda even built a Snow-Cat version to take on winter driving. In terms of development, early-sixties Japan was comparable to the China of some years ago. While the kinds of vehicles being built may be similar, it’s unlikely we’ll be crowing about Chinese mini trucks 40 years from now. 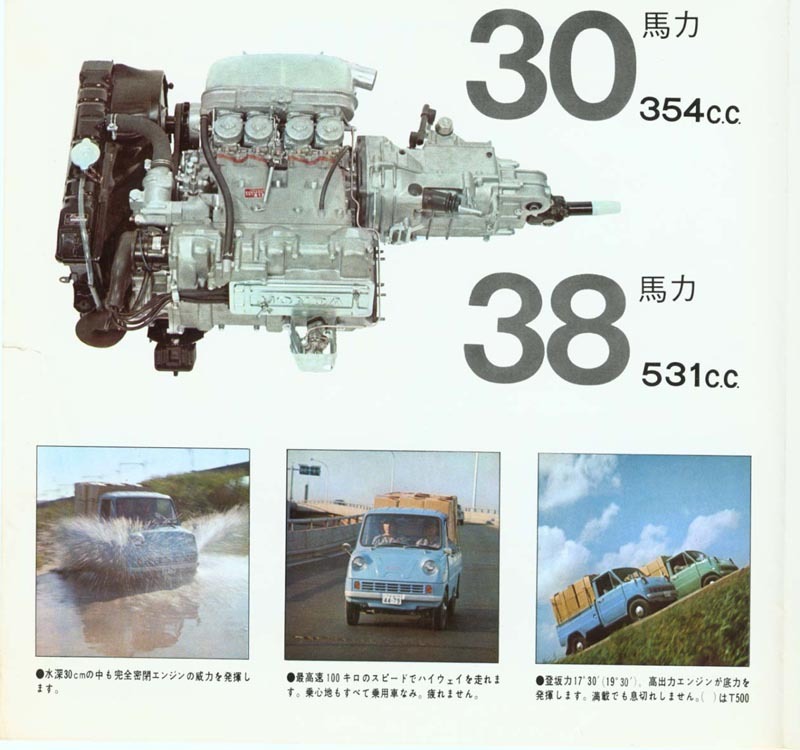 These little trucks came in two versions: The 360cc, 30-hp T360, designed to meet Kei-car requirements, and the slightly longer T500, with the larger, 38-hp engine from the S500 and a dollop of extra torque (a word seldom associated with these little screamers). 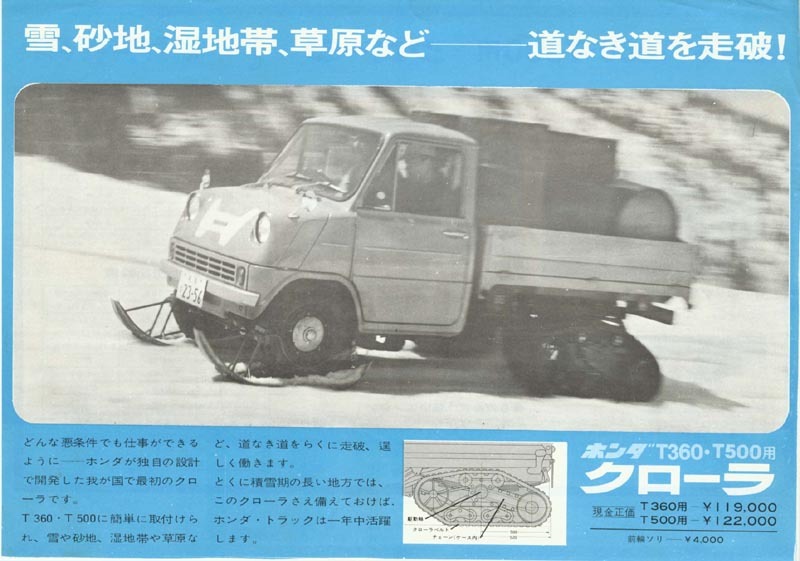 Anyway, Honda did the right thing by building the T3-trucks, since just 26k-or-so S-series sports cars were sold. 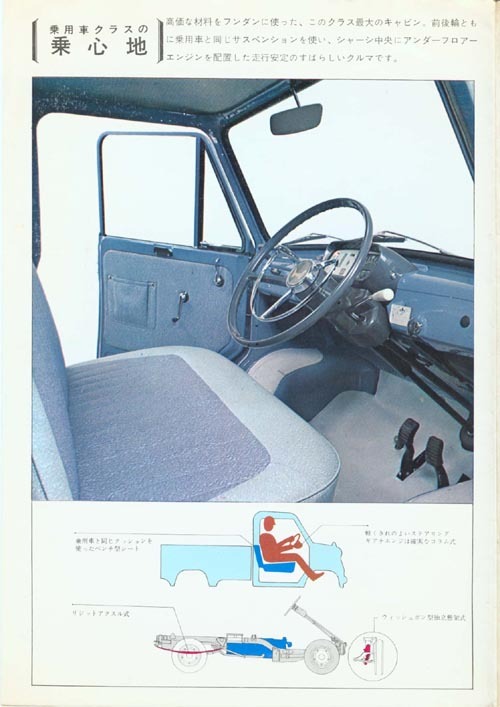 Not long after that, Honda entered the passenger car market with a more pragmatic Kei-car sedan, the two-cylinder N360 / N600, which were duly memorialized in this Curbside Classic. 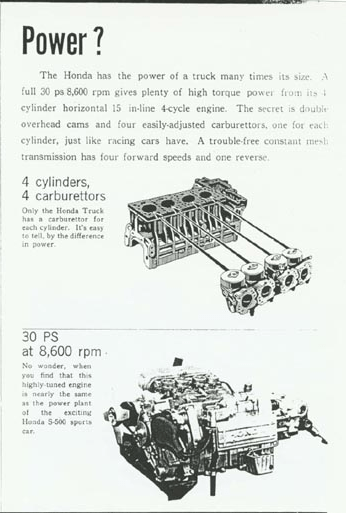 There are at least two web sites containing much in-depth info on these and other early Hondas. 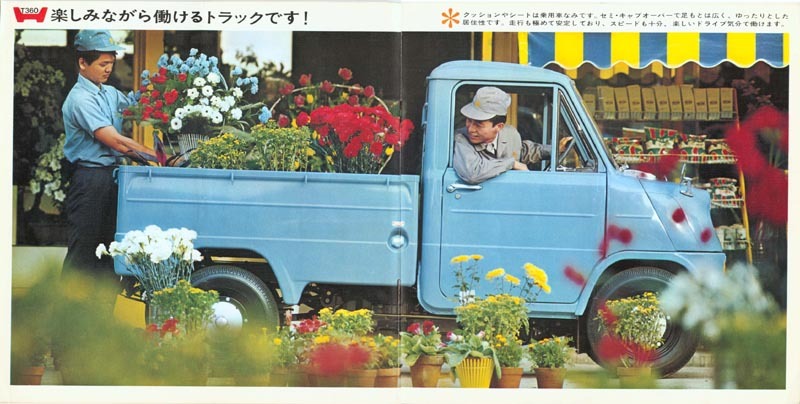 We’ll do another piece on the S500/S600 down the road, but if old Honda trucks are your thing, check out all the old brochures at hondasportsregistry.com, and this nice write-up at japanesenostalgiccar.com. (Images courtesy of those sites). I had forgotten that the the S360/600 were fours, unlike the N and Z 600’s imported to the US. I had a 350 Four (bike) and it was not hugely powerful – hard to imagine something like that in a car or truck. 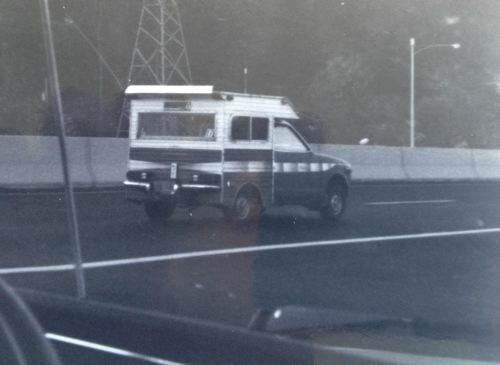 Attached is a scan of a through-the-windshield shot of a homemade Honda truck, taken on I5 outside Eugene somewhere between ’78 and ’80. If anyone can recognize the dash of the car I’m riding in, I could pinpoint the year 🙂 The donor for the camper is a Z600. Seems most Japanese companies had a go at these I shot a kei pickup for the cohort some time ago .It wasnt a Honda but it had lichen growths that I thought Paul would like. 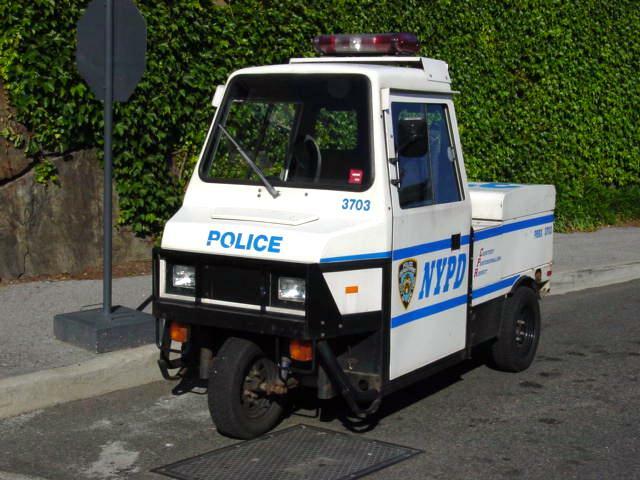 Whenever I look at these early Honda 360s, they remind me very much of the Cushman NYPD Buggies or “Golf Carts” as shown here. A lot of Japanese automakers, including Toyo Kogyo (Mazda) and I think Mitsubishi), at one point offered these little three-wheeled trucks. They were an easy step for companies that had made motorcycles or motorbikes, were more practical than a large truck for narrow streets and alleyways, and were cheap enough that people in Japan (either before or in the first two decades after the war) could actually afford them. That snow version is wild. Hondas from this era are so fabulously different than anything else out there. What a fantastic little truck but I do wonder how that high revving engine actually worked out in a hauler. I’ve heard that one has to slip the clutch quite a bit in the S600 to just get going and that is an unloaded sports car. Of course gear ratios might help here as I’d imagine the truck has pretty low top speed. Most likely. In that era, I don’t think there was anyplace in Japan with a speed limit of more than 70 km/h, so high-speed cruising was not a big priority. The top speed was a little over 100kph. Looks like you can at least bring one over here, the feds have no problem with importing a car over 25 years old. Question is, would ODOT let you put plates on it? There are flat-front kei trucks made in Japan, today – and in the West, in the Dakotas and Nebraska, there are folks selling them. Mitsubshi and Honda, probably others. They are cabover pickups, and licensed in South Dakota as motorcycles – even though they have four wheels. Regular dealers aren’t handling them – a buyer has to buy a job lot from the company, sold as is, no warranty. Retail sale is up to the lot-purchaser. Put S.D. plates on one, and drive it anywhere legally in Oregon. I was in Japan when these came out and I had no idea what it was. Thanks Paul. It’s interesting to note that the US truck market is right back where it was in 1972. Full-size domestics only; Chevy had to import the Luv to have the first American mini-truck since the Crosley. It’s like we never learn. There is a very good reason mini-pickups don’t do well in USA. Unlike many Asian/European cities, our urban centers have wide streets that accomodate larger vehicles. Since larger trucks work in cities…and in wide-open TX, WY, MT and other farm states, they are a perfect multipurpose option. Additionally, when one compares cost vs utility, the full size pickup wins every time. That sums up our entire motor vehicle market. Economy is only one of several constraints different markets have. If you can get decent economy out of a larger vehicle, people will most likely opt for it unless they need the maneuverability. The Ford Transit Connect is a hit because it’s big enough for a lot of applications and much easier on fuel than an Econoline. But even in tightly packed Manhattan, Econolines go just about everywhere. In 1950’s Europe, cyclecars like the Isetta and Messerschmitt had a market more because they were cheap than the need to fit in small spaces. A diesel-powered Golf is much larger, more economical and fits where it needs to. But that’s the practical limit for the continent. Get anything much bigger and there will be places you can’t take it. Australia is much like the US in that everything is relatively new and vehicles don’t have to negotiate ancient narrow streets. So mainstream-market cars tend to be closer to American size than European.